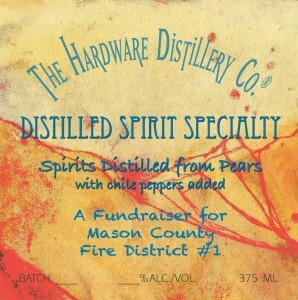 We are distilling a speciality spirit as a fundraiser for our local volunteer fire department. The Distillery will donate $5 from the sale of each bottle to the Mason County Firefighters Association. This specialty spirit is fermented and distilled at the Distillery, using prickly pear cactus and Yakima Valley pears. It is then infused with chile peppers from the Jalisco Tortilla Factory in Shelton. The chile peppers include Morita, Chile Arbol, and Guajillo. For added depth, Italian Piment D’Esplette is added. The result is a spicy hot distilled spirit, much like a chile vodka. The first sip is spicy, and the Morita chile adds a smoky flavor that shows up at the end. Each batch will be different, due to variations in the spices. This spirit can be used to make a spicy Bloody Mary, or any other cocktail that like a little spice in it.